When McCandless's innocent mistakes turn out to be irreversible and fatal, he becomes the stuff of tabloid headlines and is dismissed for his naiveté, pretensions, and hubris. He is said to have had a death wish but wanting to die is a very different thing from being compelled to look over the edge. 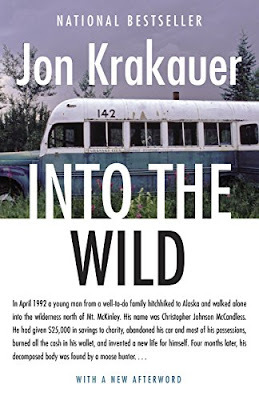 Fascinating read about Chris McCandless who decided to leave his wealthy family behind and live on the road or off the land. In the time that he was on the road he met several people and forged interesting relationships. It was remarkable that despite only have known McCandless for a short time he made a large impact on so many people. 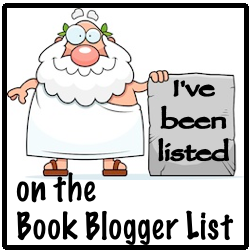 In his fateful journey into the Alaskan wilderness his life has become legend that people either think is crazy and he was just unprepared or that he was an inspiration leaving behind wealth and privilege to live a "simple" life of self discovery. Regardless of your take his journey is miraculous even to the end. 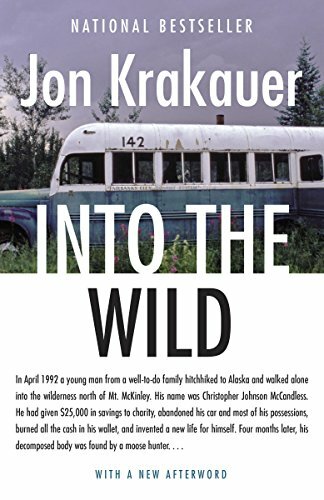 Krakauer definitely can relate to this young man and understood his drive and motivations as only someone who is drawn to risk and adventure can. This is a well written book that gives some insight into a young dreamer who lived life on his terms.